In the Empty Quarter in the Arabian Peninsula, at the opening ceremonies of the "City of the Future," a highly publicized utopian community, a riot has broken out. Members of the Justice League and The 99 are attempting to quell the disturbance. Noora the Light notices that a member of the mob has a small device attached on the back of the neck, near the top of the spine. This may suggest mind control, which would explain the unruly behavior. Superman exhibits very uncharacteristic behavior; expressing thoughts that are very cynical and judgmental. Noora the Light shines her beam at Superman, revealing that he similarly has the device on his neck. Jabbar the Powerful attempts to politely dissuade Superman from leaving, and gets a hard punch to the face from Superman for his efforts. Superman angrily complains about the mob behavior, and then takes off. At The 99 Steps Foundation in Spain, other heroes from the Justice League and The 99 continue to examine Darr the Afflicter, to ascertain the source of his recent problems controlling his power. The Atom, at tiny size, is exploring inside Darr the Afflicter's body. Hadya the Guide monitors the Atom and helps him navigate inside Darr's arteries. Jami the Assembler builds a tiny submarine for Atom to travel in, and Flash injects it into Darr's bloodstream. Atom discovers that Darr's Noor Stone has been implanted inside Darr's body near the first cervical vertebra; and reveals this to the other team members just before his submarine breaks apart from the stress. Lucius Fox of Wayne Enterprises and Dr. Ramzi of the 99 Steps Foundation, back at the City of the Future, are fleeing the angry mob together. On the phone, Bruce Wayne (Batman) urges them to find a safe location. Dr. Chou, speaking to his commander (Rughal) via video link, mentions that a micro-infestation has been spread to some, but not all, members of the population of the new City. He also indicates that he managed to infect Superman personally; but that Dr. Ramzi and The 99 have avoided contamination. Rughal tells him to proceed to phase two. A large mechanical object of some kind surrounds, engulfs, and seals off the city, blocking all communications in or out. This is the phase two that Dr. Chou has now accomplished. He speaks to his commander, who tells him merely to observe what happens next. Flash and three members of The 99 are attempting to contact Atom. We see that Atom is still alive and traveling on foot hastily inside Darr's arteries. He announces that he is coming out, and tells Hadya to have Bari the Healer ready to assist with his healing powers. They make an incision to give Atom an exit pathway. After Atom emerges, Bari the Healer uses his power to heal Darr's wound. Green Lantern (John Stewart) retrieves the Noor Stone, while Bari directs healing energies towards Atom. Jami the Assembler announces that they could not detect the Noor Stone because it was being masked by an unknown energy of extraterrestrial origin! At Mamluk International, Rughal, sworn enemy of The 99, is watching his monitors that show the violence breaking out all over the world. He is clearly malevolent, and is taking credit for the spread of violence and aggression. He mentions that he is getting a bit of help. Flash relays the message to Batman that the subversive energies are extraterrestrial. Batman contacts Hawkman, and commands him to fly upward. Jami indicates that he detects alien energies coming from Ray Palmer. Atom replies that he picked up the energies from the microscopic Noor Stone. Green Lantern contains the stone while Atom expands it. They look in amazement at what the Atom has expanded. Batman's attempts to contact the City of the Future are futile, because communications are still down. Batman is also unable to contact Superman, perhaps because he is out of range. Hawkman flies upward, now clear of the Noor Stone interference. Hawkman looks down and sees something huge and starfish-shaped, with a huge hole at the center. Switching back to Flash, Green Lantern, and the others, we see that Atom has retrieved what appears to be a miniature version of Starro the Conqueror, a classic Justice League foe. They conclude that these are not random events, but an alien invasion. Batman sums things up, saying that Starro the Conqueror has declared war on Earth. Story - 3: For me, the major appeal of this comic book lies in its focus on another religion and culture, and its efforts to promote positive Muslim values in a troubled region of the world. This book has the noble purpose of promoting positive values of peace, tolerance, cooperation, and unity in the Muslim world. I am rooting for this book, and other books featuring The 99, to be a huge success. I am intrigued by the concept of a superhero group with 99 members. This dwarfs any prior version of the Justice League, or even the Legion of Superheroes. 99 is a lot of members! I like the idea that each member has a single superpower; but that in every case, three or more members must combine their powers to be effective. That is an interesting concept. I can see why The 99 has grown in popularity so quickly. Due to the rather simplified story lines, I must conclude that the target audience is Muslims who are quite young. I am picturing these books being read, for example, in elementary school classrooms in Arabian countries. I will review these as if they are meant for very young readers, which will allow me to be more lenient when the story lines are simple and one-dimensional. I found this story to be a bit more interesting than last issue. Last issue, things seemed very simplified, obvious, and predictable. This time, we have a few surprises, including a compound threat: an alien invasion, subversive activity from Dr. Chou and Rughal, and the entrapment and forced isolation of the City of the Future. Last issue, most story elements seemed to be taken from the Teshkeel world, not the DC world. So I was surprised and happy to see Starro the Conqueror featured in this story. Starro is a classic Justice League foe. In fact, he appeared in the very first Justice League story, in Brave and the Bold #28, back in 1960. By the way, I should not have been surprised; the clue is right there in the title! There were some amusing moments this time, such as Atom riding his little submarine inside the blood vessels of Darr's body. That gave me a chuckle. Last issue, and early this issue, I thought Rughal and Dr. Chou were solely responsible for the mind control attacks, using the Noor Stones to cause hysteria and mayhem. But then, Starro the Conqueror showed up. Starro is also known for mind control. It would be too much of a coincidence that Rughal/Chou and Starro are using mind control attacks simultaneously and independently. So I see two possibilities. Either this is some sort of unholy alliance; Or else Starro is the primary threat, and is exerting his influence over the minds of Rughal and Dr. Chou, using them as puppets. We shall see. One more thought: As a loyal fan, I always hate it when Superman is the bad guy. I gave this story a 3. Very young readers can add a point. Older readers can deduct one point, unless you are intrigued, as I am, by the cultural and political implications of this book. Art - 3: The artwork is improved slightly from last issue. There are two images of Superman soaring skyward that I really liked; one near the front of the book, and one near the back. I also appreciated the shock value of the image showing a close-up of Flash's hand holding Starro the Conqueror. So although cartoony art is not my favorite, I thought it was not bad this time around. Cover Art - 4: I really liked the cover! The layouts are a bit unusual; images contained in overlapping rectangles; with a "Batman vertical stripe" down the center. But it worked for me. 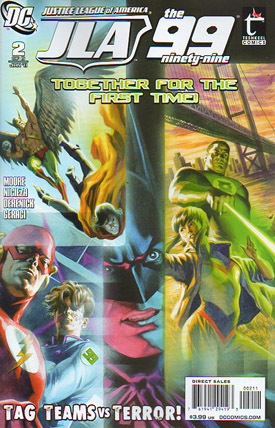 Each rectangle has one JLA member paired with one member of The 99, although Batman holds the center spot on his own. The colors make a nice contrast to the drab colors on the cover last issue. The images themselves are very nicely drawn. Felipe Massafera's artwork has a comic book realism that for me is reminiscent of Alex Ross; especially if you focus on the image of The Flash in the lower left corner.